Last October I wrote to a group of photographers to ask them to be part of what would have become the latest issue of Unless You Will, which editor Heidi Romano has released online at the beginning of December. 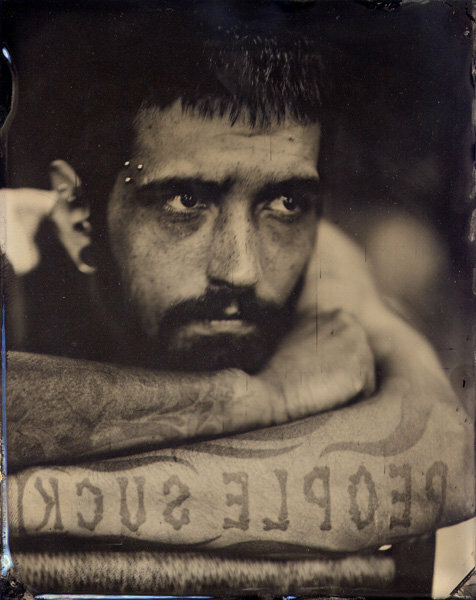 With Heidi we decided to work on a selection of artists using alternative photographic processes and my thought went immediately to David Prifti, who created beautiful images using the wet collodion and the liquid emulsion techniques. He never got back to me, until his wife Monika wrote to me earlier this month to let me know that David passed away after a two-year battle with pancreatic cancer. Had I searched for more news about David I would have found out earlier that Monika had been writing a blog with updates about his conditions since the beginning of his treatment, and I would have read about all the support by his relatives, his students, his peers. Even though his work could not be included in the magazine, I like to think that Unless You Will #19 is dedicated to his memory and his art, and our selection would remain incomplete without a look into David's fascinating world. David was one of the finest people I have ever known. He had a brilliant mind, was constantly curious and fierce friend. The smack talk between he and Monty, another MasterPlater, was legend.